Just another quick post today (with a thank you to Carol Palacios for delivering the data) on the inventory in the Tallahassee Real Estate Market. I want to remind the readers that you can always find updated information on the supply of homes in Tallahassee at //market.php. The link for all Tallahassee real estate market reports is right on our web site. The graph below is the weekly update on homes for sale in Tallahassee. Note that inventory is still dropping for all of the short-term trends, but the rate of decline has diminished. This is a little disappointing and makes more concerned about the direction of the market. I will be curious to see what happens this next week. As a reminder for those who subscribe to the Tallahassee Real Estate Blog by email, some embedded pictures and videos might not be appearing in your email and you might need to click the title header to go to your browser where all will be visible. 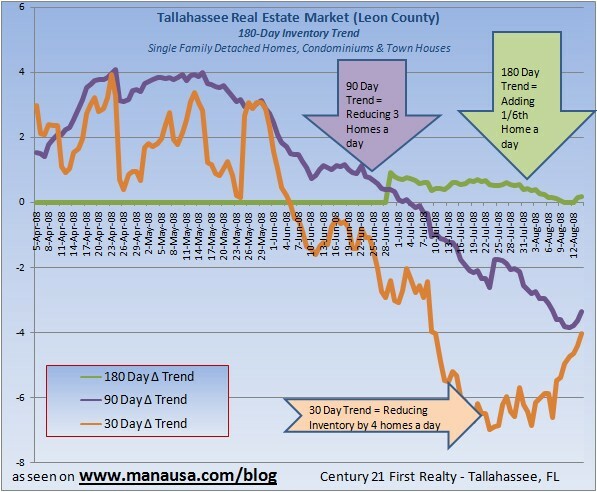 Keep checking out the Tallahassee Real Estate Blog every day for updates that include charts, graphs, and analysis of the Tallahassee real estate market. If you like this Article then please subscribe to my blog through a full RSS feed, or you can . You will be able to stay informed about the happenings in the Tallahassee Real Estate Market. You can also subscribe to this blog and have it delivered by Email. Joe Manausa is a real estate investor and the Broker and Co-Owner of Joe Manausa Real Estate. He can be reached via e-mail through the Tallahassee Real Estate Website or catch his latest writings on the Tallahassee Florida Real Estate Blog , or by calling (850) 386-2001.